Thomas und Claudia bei DAS! 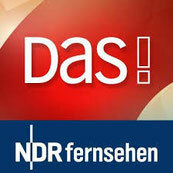 im NDR - Thomas Anders Online - Die offizielle Fanpage! Am Mittwoch, dem 21. Januar 2015, sind Claudia und Thomas ab 18:45 Uhr zu Gast bei DAS! im NDR Fernsehen. On wednsday the 21st january 2015 Claudia and Thomas are guests of the tv-show DAS! on NDR. It starts at 6:45 p.m.